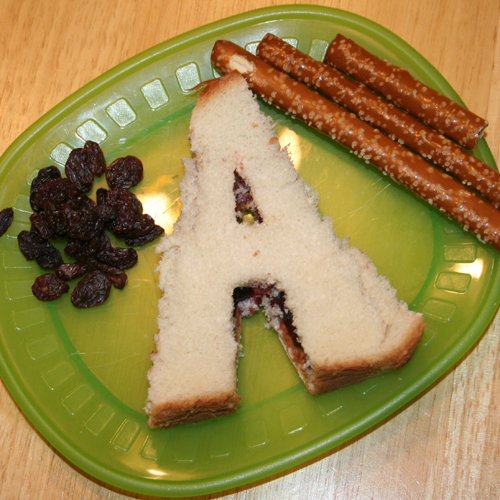 Emily and I had some fun with lunch today and used her sandwich to reinforce the letter we are learning this week. The rod pretzels were broken so that she could also make the letter A, but it was much more fascinating to eat than to play with. She thought it was pretty cool. In addition to our fun lunch we read books and looked for the letter A and attempted to trace the letter with our finger. Tomorrow’s fun food is going to be pancake shaped letter A’s for breakfast. I have a variety of things to do with her to reinforce the letter of the week and we will see how it goes over the next 26 weeks. If every day could be as fun as today was we will be doing well.